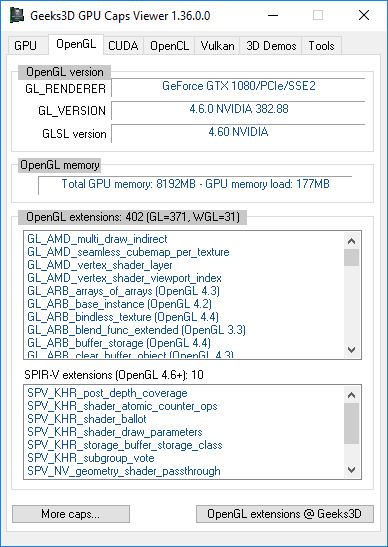 GPU Caps Viewer 1.36.2.0 comes with the support of Radeon RX Vega 64 / 56 and fixes a bug that prevented the GPU monitoring (GPU panel) from working when a GeeXLab demo was running. 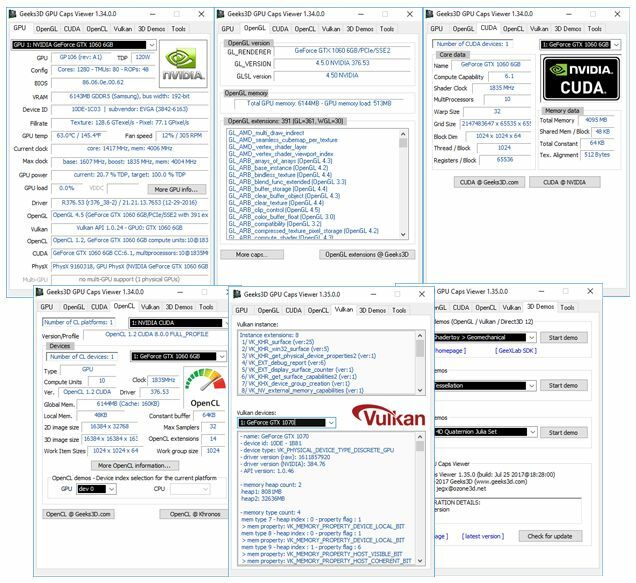 GPU Caps Viewer 1.36.1.0 comes with two or three new demos (Vulkan, OpenGL) and improves the Vulkan support (GeeXLab SDK). a GeeXLab demo was running.
! updated: ZoomGPU 1.21.1 (GPU monitoring library).
! disabled custom widget colors.
! updated some Vulkan and OpenGL demos.
! improved the Vulkan plugin (GeeXLab SDK).
! recompiled with latest Vulkan API headers (v1.0.57). + added support of OpenGL 4.6 (SPIR-V extensions). + added Vulkan driver information to the TXT and XML report.
! 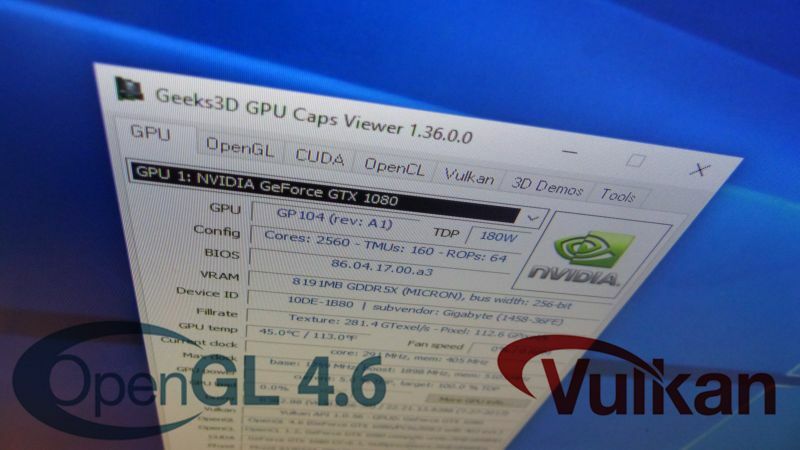 Vulkan plugin (GeeXLab SDK) for Vulkan demos updated (minor bugfixes). + added support Radeon HD 7340 (devID: 0x9808).
! updated: ZoomGPU 1.21.0 (GPU monitoring library). 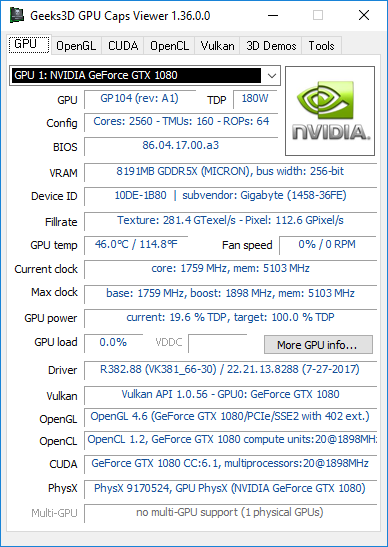 Nice tool to know about your graphics card GPU details. I just installed v1.36.1 and immediately found a bug. GPU Caps is showing incorrect values for the GPU Clock. When the GPU is running at full load (and at full speed), GPU Caps shows wrong values,. I can Run GPU shark at the same time and it shows the correct values. When I close the demo window, only then it shows the correct values, until it starts clocking down due to not being used. But if I run the demo again, it’s stuck in the low clocks and doesn’t update correctly. Yes I just saw this issue. It looks like it’s related to GeeXLab demos only. Built-in OpenGL and OpenCL do not prevent the GPU monitoring. I will look at this bug asap. The bug is fixed. Available in the next update. The v1.36.1.1 is in the ZIP version. But this build does not contain the GPU monitoring bugfix. It will be available in v1.36.1.2. Just notice the HUGE difference between the current clocks shown in GPU Caps and GPU Shark..
Oh, and the temps do not update, either. just curious, when is the next version coming? probably right after the first reviews of Radeon RX Vega 64 so the update will have Vega 64 support at the same time. Got a Gpu_Caps_Viewer.exe is not a valid Win32 application error message on windows xp pro sp3 updated till eol , _log file comes empty. Same here. W2003R2 SP2 32-bit. 1.36.2.0 – both “portable” and “win32 installer” says this. Yes, it’s fixed in the new GPU Caps Viewer 1.37.x. Thanks for the feedback!